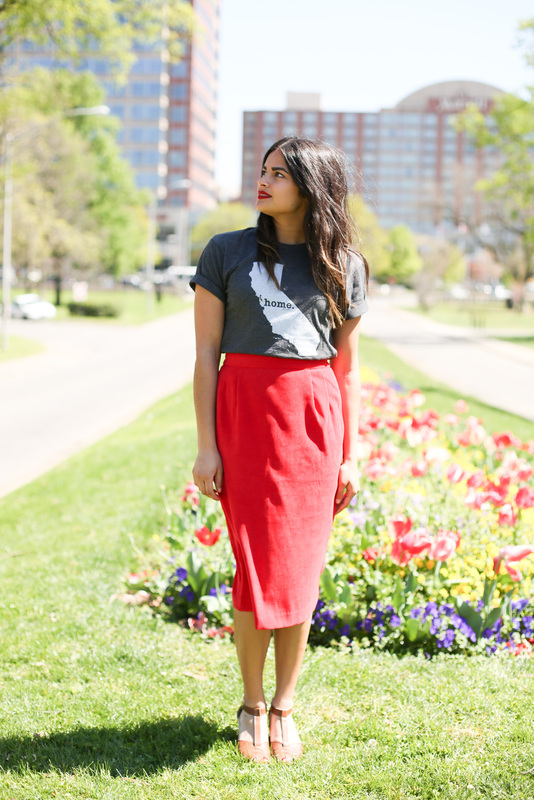 Graphic Tee Time #2: Home T | Priya the Blog | life & style in Nashville & beyond! Good afternoon, and welcome to Graphic Tee Time, The Home Tee edition! Thanks for joining me and Sarah for the most lovely part of the afternoon. 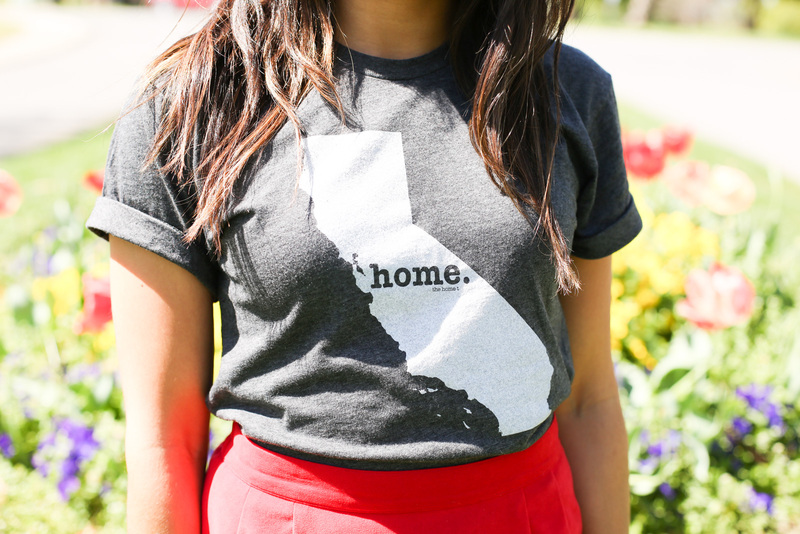 I hope there's no way you don't know this, but though I've lived in Nashville, TN on & off since 2009, I was born, raised, and will always return "home" to California. It's so much more than just a (n amazingly beautiful!) place to me! It's my heart and soul, my heritage, and where so many of the people that made me, ME, call home. I could go on forever...I am very statriotic. I love living in Nashville, just don't ever call me a Southern belle, cool? Shout-out to my sister Galina for gifting me this awesome t-shirt, that reps my home state wherever I go! 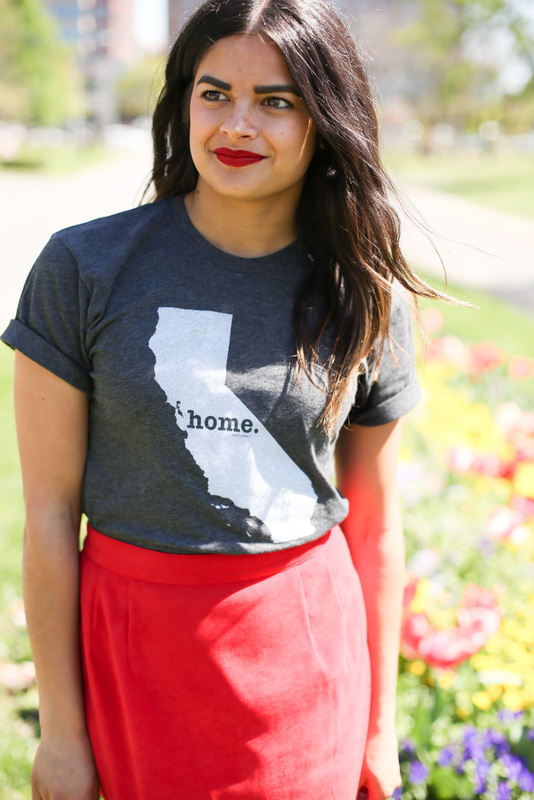 I didn't even realize the full concept behind The Home Tee, which debuted on Shark Tank, and is committed to manufacturing in the US AND donating to Multiple Sclerosis research. Not bad for what's also an insanely soft t-shirt! For my second attempt at styling a graphic tee (this time around, anyway. 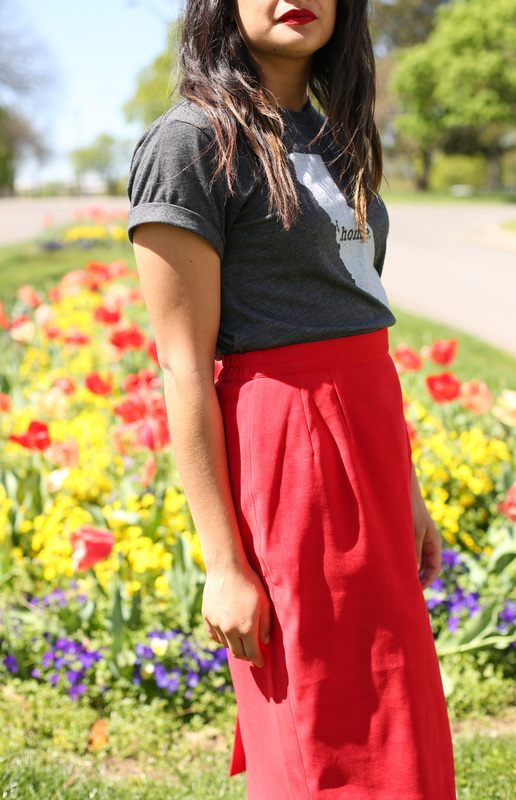 Graphic Tee Time #1 here) I went with my never-fail red midi skirt. I've pinned several graphic tee + pencil skirt looks that I absolutely love, but when I went to put one together, I realize I don't really own pencil skirts! I rocked a graphic tee with jeans every day of the week in grade school, but nowadays, an outfit like this is a lot more conducive to my lifestyle (working in a super-cas office, but still dressing up a bit.) 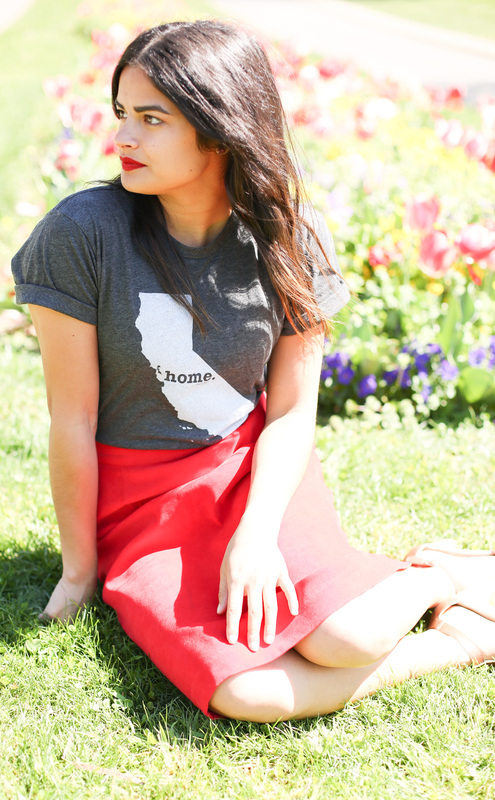 I think a pretty skirt and red lip (and of course clogs because #clogsforever) were the perfect way to dress up this tee! How do you dress up a tee for work? While I'm reppin' the Golden State, my co-host Sarah is showing some love to the Sunshine State- Florida (which I also enjoy, btw!) I love the overall cool-girl vibe Sarah has going here; with the shades, lipstick, fitted pants & flats really elevating what would otherwise be a tee + jeans. 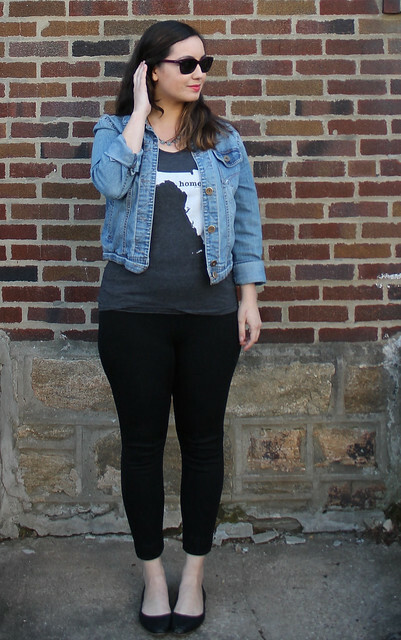 Be sure and head over to Shades of Sarah to see her the full post! Thanks for following along with #GraphicTeeTime! Don't forget, on Thursday, April 28th, we're making this a full on SHEBANG where we'd love for as many of you as possible to link up YOUR graphic tee outfits! Ladies, start your engines. teapot graphic by my wonderful friend Taylor! Okay so I am super jealous of this post because I have a home t shirt but I somehow lost it in a move and that damn shirt is SO COMFORTABLE!!!!!!!!!!!!!!! This is adorable! So cute!! I've been wanting a t-shirt like this with NY on it! I wish I looked as good in red lipstick! Wow! What a cute shirt with a great cause behind it. Have a great weekend.